The connector needs roughly 100 newtons (24 lbs) of force to plug in. If it seems the connector will not mate with this much force, check the plug and connector for damage or foreign objects. The charge indicator light will flash green when the robot is charging. When the robot is completely charged the indicator light will stay solid green. The charge indicator light will turn red when the battery voltage is low. When the charge indicator turns red, you should recharge the robot. If the battery voltage gets low enough, the robot will automatically turn off. In some cases, the charging circuit may detect an error condition and will flash the charging indicator red. After about 1 minute, the charger will attempt charging again. If the error condition persists, a support ticket should be created to address the problem. One notable charging error is caused by the Power Disconnect Switch being switched off. When the power disconnect is switch off, it disconnects the battery which prevents the charger from working. When the charger detects this situation it will flash both the charge indicator red, and the power button at the same time. The robot will typically need about 3.5 hours to charge batteries from empty to 90% capacity. It will take an additional 3 hours to charge remaining 10% of battery capacity. While the robot does not need to get to 100% on every charge, it is strongly recommended that the robot be fully charged at least once a week to get the best possible life out of the batteries. Charging works whether the robot is on or off. It is perfectly acceptable to have robot move its arm, torso, and head while charging. 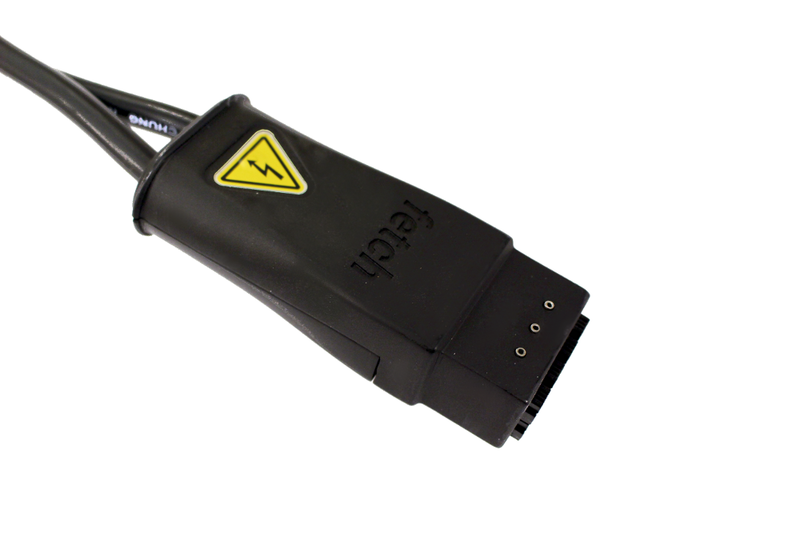 However, you should not drive the robot while charging because it is easy to misjudge the cable length and damage the wiring or connector. There are also some important rules that should be followed to prevent damage to robot and charging supply. When disconnecting the supply from robot, grab plug and pull out. Never pull on the cable to pull out the plug. Also, when moving power supply brick, do not use cable to pull it around. All copper wire has poor tensile strength and can break with too much abuse. Pull straight back when disconnecting the supply plug, do not pull out at an angle. The connector is not designed to support large sideways forces. It is easy to pull in the correct direction when grabbing the plug, but not when pulling on the cable. This is another reason that the plug should never be pulled out using the cable. Do not attempt to drive robot while plugged into charger. In our experience it is too easy to misjudge the cable length. The robot is heavy and the drive motors can produce high torques. The robot can easily rip out the connector and cord even while moving at slow speeds. Even when turning in place, its possible to pull on the plug if the robot happens to drive over the cord. If the supply wiring or connector is damaged, do not attempt use the damaged supply. Instead create a support ticket to get the damage part fixed or replaced. The robot uses two large sealed lead-acid (SLA) 12V batteries. These batteries should provide many hours of robot run time. Like most chemical battery technologies, the amount energy the batteries can provide will decrease as they age. Luckily, replacing the batteries is simple and relatively inexpensive. Even so, there are few things that can done to improve battery lifetime. Keep batteries charged. Leaving SLA batteries in partially discharged state will age the batteries more quickly, reduce useful running time. Therefore, if the robot is not going to be used for a prolonged period, it should first be fully charged, and can be safely left on the charger during this period. Alternately, after charging, you can remove the top covers on the base and disconnect the batteries before storing the robot. Avoid deep discharge of batteries when not necessary. Battery will age less when discharged twice to 50% capacity than discharged once to 100% capacity once. Fully charge battery instead of just partially charging battery between uses. While this is not always feasible, it will slow the rate at which individual battery cells get out of balance. When doing heavily cycling of batteries, leave the batteries charging for an extra long period of time, at least once a week. Even though the batteries may be fully charged, leaving the batteries on charger for longer period of time will help balance out differences in individual cell voltages that accumulate over time. This not as important when batteries are only discharged small amounts during each use. Keep robot cool. Cool batteries age less than warm ones. In the case where your robots batteries have reached their end of life, you can contact Fetch Robotics Support to acquire replacements. In the mean time, you can continue to use the arm, torso and head while the robot is connected a charger. The robot is not designed to be run without a battery, so end-of-life batteries should be left in the robot. If the robot is operated with the batteries disconnected, electrical components could potentially be damaged and need replacement. Using ‘apt-get upgrade’ and ‘apt-get dist-upgrade’ could cause critical software, such as the kernel, to change. We can not guarantee your robot will function after making such a change. We recommend against using these commands unless you understand and accept the risks. Each circuit board within the robot is equipped with a bootloader, allowing new and updated firmware to be installed. New releases of the fetch-drivers package may include updated firmware for your robot, which will automatically be installed when the drivers are next started (typically by the robot upstart service). When restarting the robot service, there may be a slight delay before the drivers are fully operational if a new firmware upgrade is included. If someone has changed or deleted the default apt-get sources then the following commands will create sources.list files so that the robot can see the public ros package server and the Fetch Robotics package server. To clean fingerprints, dirt, and smudges from the skin of Fetch and Freight use a clean soft cloth and isopropyl alcohol or window cleaner (e.g. Windex). Make sure to wet the cloth with the isopropyl alcohol or window cleaner, and then gently clean the skins of the robot. Do not spray or pour isopropyl alcohol or window cleaner directly on the skins of the robot, this may damage the skins or worse cause fluids to enter the robot. To clean the sensor optics of Fetch and Freight use the lens cloth provided in the tool kit. Lens tissues or cotton swabs are also good options for cleaning the optics of the robot. Do not use window cleaner, acetone, or abrasive cloths on the sensor lenses as this may cause damage to the lens.